26th Convergence India 2018 expo, and the co-located 2nd Internet of Things India 2018 expo,were kicked off at Pragati Maidan, New Delhi today with a dive into robotics and artificial intelligence thanks to an opening address by Mitra, the charming Made in India robot that captivated his audience; true to his style. The inaugural ceremony saw Union Minister of State for Communication (IC) Manoj Sinha, who also holds the railways portfolio, taking to the stage in front of a packed crowd to explain how events such as Convergence India and IoT India are of special relevance to the country; how the emerging 5G technology is the most important area where India aims to be a leader; how all equipment and components for the BharatNet project are indigenously manufactured to boost the Make in India campaign, among other relevant subjects. “In the last three years, 266 million mobile connections and 140 million additional Internet connections were added. We had a meager 5 telecom equipment manufacturing units in 2014; today we have a staggering 118 such units manufacturing more than 22.5 crore mobile handsets,” said the Minister. The Minister also released the knowledge paper titled, ‘Outlook for Indian Telecom and Broadcast Industry’, by Frost & Sullivan that analyses the latest market trends and captures the industry outlook for the telecom and media industries. The Internet of Things is revolutionizing our world, and another standout highlight at the expo included the packed speaking session on ‘IoT Revolutionising India’. The impact of technology on social change and empowerment was discussed during the session. “India lacks physical infrastructure such as roads, water, development in cities, etc. Technology enables us to overcome these difficulties and leapfrog such obstacles. Technology should be inculcated as an active medium for social transformation. Therefore, it needs to be ubiquitous and available. Regulatory and policy space has to change and has to embrace data driven algorithms,” said Mr. R S Sharma - Chairman, TRAI. “There are almost 127 devices globally connected to the Internet. We are expecting an economic impact of 11 trillion by 2025,” said Dr. Neena Pahuja, Director General, ERNET, India. 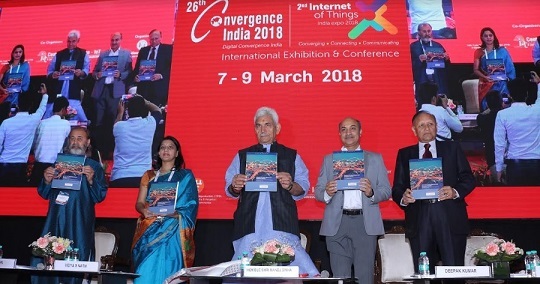 “Convergence India and IoT India are platforms for convergence of technologies and business exchange, with focus on telecom, IT, broadcast & digital media sectors, and IoT. This dynamic centre point, where rapidly evolving technology industry leaders meet to gather information and compare views on shared opportunities and challenges, attracts a worldwide audience.India has been one of the fastest growing markets in Asia in ICT adoption and communication technology, and the country’s rapidly expanding Internet base and broadband connectivity, and the many e- Governance and citizen-centric projects will bring exciting times for governments and businesses focused on innovation and customer centricity. The expos are the industry’s leading event, resolved to discussing solutions for advancing India’s technology future,” said Prem Behl, Chairman, Exhibitions India Group. With 684 participating companies spread over 25,000 sqm exhibit space, Convergence India and IoT India are hosted by India Trade Promotion Organisation (ITPO) and Exhibitions India Group (EIG), the expos support the Government’s vision of transforming India into a digitally empowered economy. NASSCOM Center of Excellence – IoT is co-organising IoT India 2018 expo. ITPO, the premier trade promotion agency of the Ministry of Commerce & Industry, Government of India is committed to showcase excellence achieved by the country in diverse fields, especially trade and commerce. ITPO provides a wide spectrum of services to trade and industry, and acts as a catalyst for growth of India’s trade. Exhibitions India Group is a trade promotion organisation creating opportunities for investments, joint ventures and technology transfers. Exhibitions India Group acts as an interface between businesses, government, academia, society, media, etc. Exhibitions India Group has been in existence since 1987, and is committed to providing satisfaction to its customers by organising quality and focused international trade shows through exceptional services, employee involvement, market intelligence and continual improvement. For more information, please visit: http://www.exhibitionsindia.com.